» What about that ‘east anchor’? What about that ‘east anchor’? This is where a downtown plan envisions some kind of development. Five years ago, an update of Albany’s downtown plan called for two “anchors” to help revitalize the central area. On the west end, there would be the Albany Carousel, now under construction. 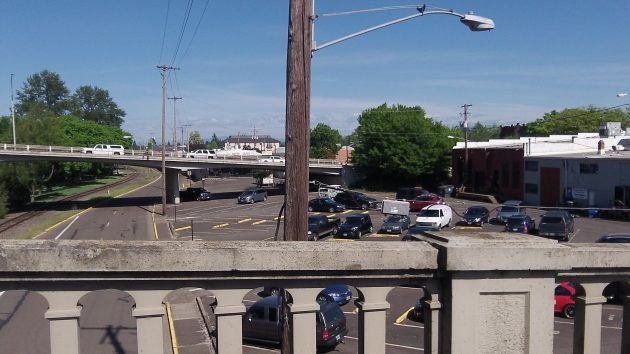 On the opposite end, there would be an unspecified “east anchor” on the south side of Water Avenue between the Willamette River bridges. It’s still a city-owned parking lot, though, and nothing else has come up. To help with the idea of the east anchor, city officials once proposed a “slip lane” that would allow drivers to get to Water Avenue from the right lane of one-way Lyon Street before having to head across the river. But ODOT discouraged this idea. SCI stands for the University of Oregon’s Sustainable Cities Initiative, a program that pairs students and faculty with local governments that want help with projects. Albany has agreed to take part in the program this coming academic year. Sounds like a nice collaboration between the city and OSU students. Sounds as though the City Urban Renewal Manager gave Ol’ Hasso the slip lane, alright. Without the benefit of having a Donald Trump-Type Developer in Albany, it is difficult to see how a major parking lot conversion can happen any sooner than when it happens. To insinuate that there is some slackadasicalness amongst City Urban Planners just because they haven’t converted a parking lot into a 7-story, multi-use, green-roofed bonanza paying millions in property taxes. Hasso, you need to take a longer timeline. Or, the City could reverse it’s absurd ban on pot sales, and use the 3% local pot sales tax option to lift that long-awaited East Anchor off the river bottom. Commandeer the railroad bridge utilizing the CARA-funded Albany First Militia. Once we control the waterways, Corvallis will fold like a cheap suitcase. Once Albany’s Finest are in control over in Benton County, we will force the enslaved citizens of Corvallis to build a wall with Their Own Money. When this plan falls in place, Hasso will no longer be second guessing the long term wisdom of the Albany City Council and our august Mayor. The East Anchor is a distraction but will prove useful over time. Well, if no private sector folks are interested, what about a public market space with vendor stalls? A shell structure to protect from rain and winds with natural lighting, and some electrical services for vendors. Permanent restrooms that could be used all year and support the waterfront. It could give a permanent home to the Farmers Market and allow them to consider multiple days per week like Saturday, Sunday, Wednesday. And with expanded shopping to include art, crafts, and even daytime cafe seating where you could grab a glass of wine or beer. Like the Mercado’s you see in Spain. It might even expand to a full 6 or 7 day operation for small businesses. Sounds a lot like Pike St. Mkt in amazing Seattle. Perfect! Great suggestion BW!! Bob, it’s flattering that you think the farmers’ market could be part of the solution. I hate to be a wet blanket, but these things rarely pencil out well. I think of market structures as a case of Be Careful What You Wish For. Someone has to fund development, and then the market has to pay rent it probably cannot afford. Our 4 hour market span concentrates the crowd so that farmers can be home farming. If you have to hire someone to sell for you that changes the balance point on the day. Albany is a great city, but it does not have the population and tourism situation of Seattle. We would consider adding a day only if we were confident of untapped demand. The Vancouver market nearly crashed and burned inside the Esther Short building and is now entirely outdoor again. Customers were expecting more food than crafts, but crafters were the bulk of vendors. They behave as if they have time and money to burn, compared with farmers. But how many times do you buy a craft vs carrots? Springfield has an indoor market, but NEDCO does not have to cover rent because they own the building. I suspect they are not breaking even. There’s a kitchen, and both the market and kitchen connect with their entrepreneurship programs. Has anyone discussed the current slope? That and the forest of parking blocks eliminated it from consideration as an outdoor site. It might be enough that a building there would have multi-level access. If there are access issues endangering for-profit activity, those issues are no less applicable for non-profit activity. Parking garages — Google the cost per square foot. I guess no one heard–the City elected and staff all had a meeting to discuss what can be done to revitalize downtown sine the $10M spent by CARA did not do the lifting and the sense is that the merry-go-round won’t do it either. Just saw another 18wheeler hit the RR bridge–can’t solve that either. Tom no need to fool people to try and be relevant. The difference in downtown between 1996 and 2016 is drop dead dramatic. Go see an ophthalmologist for a vision check-up. You don’t seem to have any vision at all. Will the new Hasso Hering app be available in iOS or Android-only? No app, sorry to say. People will walk a few blocks to places they really care about. If there’s just another McDonald’s (with no bike racks like in Hasso’s later story), you’re right, it will probably fail. Top two levels = parking garage. Nice wink! In the parking lots. Look at the plan again.